The national focus on supportive oncology and palliative medicine is intensifying. The Coleman Foundation seized the moment to launch the Supportive Oncology Collaborative (SOC), an ambitious initiative that builds upon its 35 years of experience to improve cancer care. 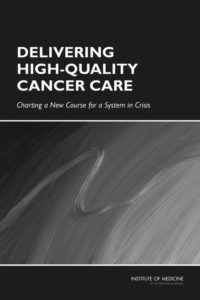 The Institute of Medicine’s 2013 report, “Delivering High-Quality Cancer Care: Charting a New Course for a System in Crisis,” set in motion recommendations that include supportive oncology. With few standards available, the Coleman Foundation engaged 135 medical professionals from 25 Chicago area cancer care institutions to create and implement new screening tools for concerns and standards for care for cancer patients and their loved ones. Through two cycles of funding, the Coleman Foundation enabled 10 sites to implement comprehensive screening tools and new processes. As a result, outcomes were promising; sites hired additional medical staff and began implementing additional supportive care practices to a greater number of cancer patients. The Coleman Foundation Collaborative is a care delivery/process quality improvement initiative. The Supportive Oncology Collaborative participants identified opportunities and gaps in supportive and survivorship care, depicted in the diagram on the left. To address these gaps, three inter-institution collaborative design teams iteratively developed and piloted screening tools, follow-up processes, provider training, and quality metrics, each providing expertise and content from their respective areas of focus: Distress/Psychosocial, Survivorship, and Palliative Care and Hospice Referral. Tools, processes, and training are in various stages of implementation at participating quality improvement sites. providing supportive services to patients and their families.